Whether it’s the 4th industrial revolution or the ‘Age of Connection’. Increasing speed, complexity, and uncertainty of today is shifting and challenging Leaders in the workplace environment. Ordinary situational and strategic leadership development may make your Leadership ‘Self’ (ego) feel more knowledgeable or capable, but it is not up to the challenge of resolving a Leaders partially informed reactivity to forces outside of its control, or seeing beyond ‘my view’ toward a more integral and inclusive perspective and wisdom. 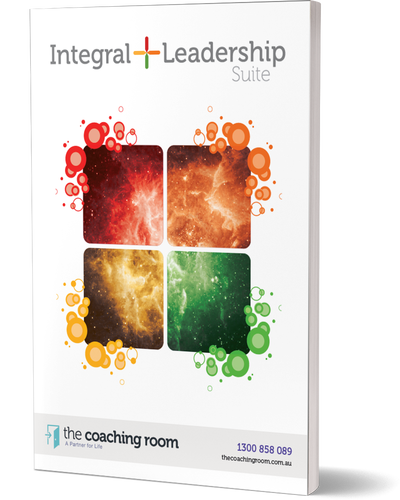 The Coaching Rooms’ Integral+Leadership™ program provides a leadership framework (A Map) for giving Leaders simple and yet, profound perspectives. It unlocks capacities and the innate wisdom of the Leader, needed to Lead themselves, their followers, industry and the stakeholders of today, effectively and successfully into a vibrant and flourishing tomorrow. At Last a Map, The Map! that truly charts the territory of individual, team and Organisational Leadership, issues and solutions! Based on Integral theory (Ken Wilber et al - an all-inclusive mesh that draws on the key insights of the world’s great knowledge traditions) Integral+Leadership™ utilises a single developmental model; The 4 Quadrants, across all 5 days of this program. Making the learning simple, deep and embodied. The wisdom gained from drawing on ‘all truths’ and ‘all perspectives’ of The 4 Quadrants, allows the Integrally informed Leader to bring new depth, clarity and heart to every level of human and business problem and opportunity — from unlocking individual and team potential to finding different approaches to cultural, organisational and global-scale problems. Based on Integral Theory, that shows all human knowledge and experience can be placed in a four-quadrant grid (The 4 Quadrants), along the axes of "interior-exterior" and "individual-collective". It offers some of the most comprehensive approaches to reality, to explain how academic and organisational disciplines are brought together and every form of knowledge and experience fit together coherently. Our Integral+Leadership™ program provides an overarching model that awakens and integrates ALL leadership and Organisational development theories on one single page! Enabling Leading attitudes and perspectives. Leading Behaviours and presentation. Leading culture and systems. Evolutionary Leading. Moving from coping, to Managing to Leading, through situational Leading often rests in active and reactive strategies and behaviours. Our Integral+Leadership™ suite offers the power and agility of Contextual Leadership that is not dependent on reactivity or the situation. The contexts, multiple-perspectives and distinctions shared via The Quadrants across this program provide a living and comprehensive wisdom that once learnt and practiced, seem kind of magical, like the response, be it an answer, offer or statement, seems to be with the Leader before the question or need even arose. Our Integral+Leadership™ suite is delivered In-house usually on the premises of the organisation engaging the program. It is a 5-day corporate Leadership training program that can be scaled organisation wide both nationally and internationally. Below you will glimpse the potential of each day. This day Utilises the Self or Individual quadrants in developing the perspectives, attitude, Knowledge and communicating and behaviours for highly effective self-Leadership. Using developmental action inquiry to formulate intentions leading to realising and be-coming a more Integral Leader of Self. This Day Using the collective quadrants lower lower left and lower right in developing contextual Leadership awareness and abilities for leading others. Using developmental action inquiry to formulate intentions leading to realising and becoming a more Integral Leader of others. Using the quadrants to identify a Leaders current way of leading. Working collectively to identify the ultimate expression of a Leader within the organisation. Finally to map out the new or different way of the Leader toward becoming an Integrally informed Leader. Using all 4 quadrants to envision and Integrally informed Leadership vision. Identifying one key aspect from each quadrant to contribute to an overall Integrally informed Leadership vision and statement. Using 4 quadrants lenses for analysis of business issues and objectives & Developmental Action Inquiry to identify and manage/ lead new and different Integrally informed approaches to business. “We have just reconnected “The Coaching Room” after a couple of years to work with our new Management team, in the areas of Leadership and Leading in times of change. Our team is now much more constructive, focused and even insightful in our Leadership (and interactions with each other) we have also now developed an ability to want to Lead in change rather than avoid it. It is taken our Leadership team to the next level. Money well spent! I have worked with Jay for over two years in my capacity as Head of Human Resources for Fiji Airways. Jay's interventions were aimed at the effectiveness of the leadership team as a whole as well as the coaching of individual members of the senior team. In addition, Jay has been directly involved in leading the Leadership Development Programs for the Executive Management group as well as a group of high performing employees. I can quite honestly say that Jay's interventions have had a remarkable effect on the airline leadership as a whole. He has actualized the potential of several individuals which has been a pleasure to see unfold and has played a huge part in partnering with the airline to build the effectiveness of the executive team. Jay's energy, integrity, mastery of his speciality coupled with a wonderful sense of humour has been a truly delightful experience. I will most certainly be reaching out to Jay in the future as I move forward with another organization's transformation process.